The EcoCents Dispenser Program, a simply perfect amenity solution: high quality liquids and dispensers with no capital costs! 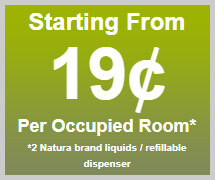 FREE dispensers, FREE liquids and FREE shipping (lower 48 states) all for just pennies per occupied room. Hotels save 30 – 70% in costs while reducing waste by over 90% compared to traditional packaged amenities. Why haven’t more hotels used dispensers in the past? Liquid was all-in-one shampoo / soap. Travelers DO NOT want to wash their hair with the same product with which they wash their bodies. Cartridges were NOT leak proof. Guests were NOT informed about the quality of the product nor the environmental benefits of dispenser use. How does Green Suites Hotel Solutions address these issues? We only use attractive, durable dispensers available in a variety of colors & finishes to match any bathroom décor. All dispensers are available in one, two, or three product varieties so that guests can be offered separate shampoo, soap and even conditioner in the shower and hand soap, lotion, or both at the vanity. Improved technology, product cartridges are leak-free and available in refillable or sealed, prefilled (non-refillable) options. Guest informational materials are available to help communicate the environmental impact of the dispenser & quality of products. Custom options available. Do we have to buy the dispensers? NO. Dispensers and liquids are all included with the EcoCents Dispenser Program. YES. Green Suites Hotel Solutions offers trial programs. Dispensers, personal care products and guest comment cards are provided at no cost or commitment, as part of the trial program.